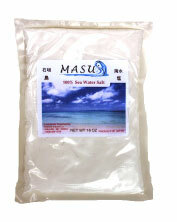 Masu sea salt is not a harsh crystallized bed salt. Salt crystals harvested from salt beds may contain unwanted substances such as dirt and limestone, and reflect a compromised mineral balance caused by leeching and over exposure to sunlight. Since Masu Salt is created directly from sea water, its nature is more like a soft salt "flake" which is very gentle on the body. Enjoy this unique, nutritious sea salt for your health and well being. This amazing salt truly redefines the term "fit for human consumption."